Golf is one of the world's classic sports and a hobby of millions of people. It is one of the few games that's enjoyed by all ages and played by both men and women. While competitive golf has become a major money-earning sport, for many, it is more like a contest against oneself, set against the backdrop of beautiful scenery. Golf is an activity that lends itself to different kinds of gifts, since there are all sorts of items on the market aimed at helping a golfer improve their game. There are also all kinds of occasions throughout the year to buy golf gifts for your favorite golfer. Whether it is Christmas, a birthday, Father's Day, just because, or any other occasion, the right gift will remind the golfer of you day after day. Finding the perfect gift for a golf lover is a pretty easy task. There are plenty of golf-themed gifts for any budget in the market. The hardest part of buying golf gifts is probably choosing between the numerous options. When it comes to golf gifts there are plenty possibilities to find that perfect something for the golfer in your life. You can concentrate on golf equipment, apparel or accessories, but no matter what you choose, you can’t go wrong as all of these items are necessary for a successful and pleasant game. The most important golf equipment for any player is surely a set of golf clubs. New clubs are something golfers are constantly buying trying to improve their game as many believe that their clubs are the reason for their success or failure. It's great if you know what kind of a golf club your recipient prefers, otherwise you can always go with classic ones. A golfer can never have too many golf balls. Whether hitting some balls in the backyard, at the driving range, or playing an actual round, premium golf balls are an excellent accessory. They come in every color and composition to suit every taste and talent. Treat the golf lover in your life to high quality golf balls among other equipment they will need for a successful game and be sure your gift will be highly appreciated. The possibilities for golf accessories included in a golf gift basket are countless and can include everything from golf clubs and balls to snacks and beverages. When choosing a golf gift basket, try to pick something functional, such as a cooler or a metal bucket. 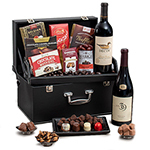 A golfer's gift would not be complete without food items. 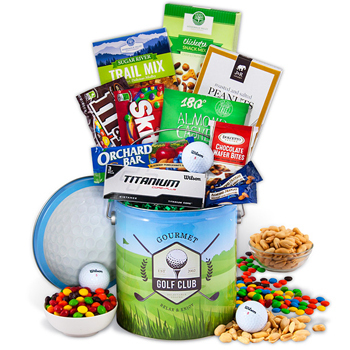 Look for hampers that contain gourmet treats like chocolate golf balls, beef jerky, nuts, cookies, pretzels, energy bars, and other snacks to keep the golfer at their best out on the course. Bottled water is also a must for the weary golfer. Beer can be a good alternative and will be enjoyed by both your recipient and their friends or family after a round of a game. Other useful items usually included in a golf hamper include club towels, replacement tees, golf-themed mugs, sunscreen, and more. For the avid golfer in your life, there is no better gift than one that recognizes their passion for chasing that elusive little ball around the wide open spaces. Make the agony and pleasure of the game more memorable for your dear golfer by giving great accessories in a golf-themed gift basket suitable for any occasion and recipient.